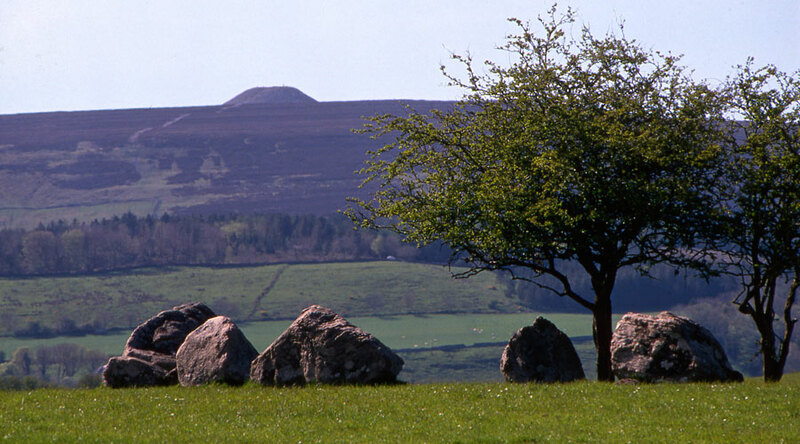 Site 9, Carrowmore, with a fine view to Queen Maeve's cairn on the summit of Knocknarea. Photo from a postcard © Office Public Works. 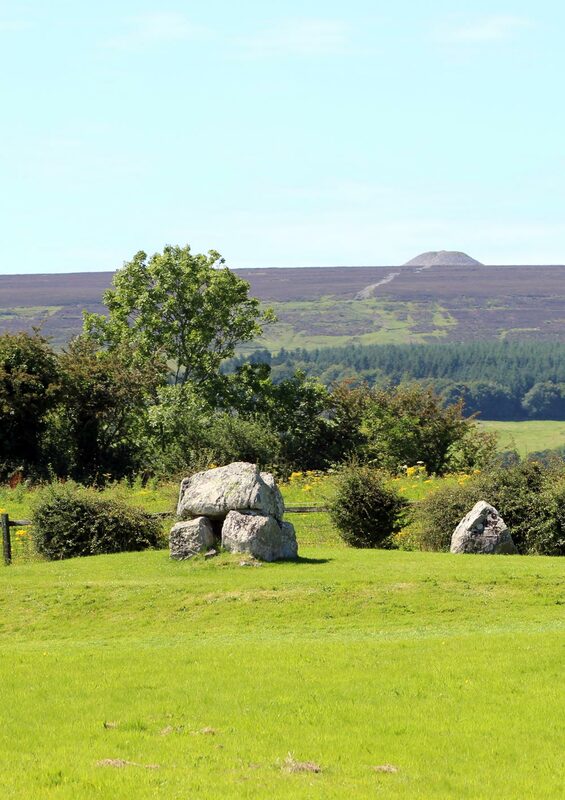 These three monuments present some confusion, as they do not appear to be a part of the carrowmore complex proper. Stefan Bergh calls them 'spaced boulder circles', as they are not complete circles. They also are found outside the main cluster of monuments, being found to the north of the Carrowmore group. The stones are, in general, much larger than those in the Carrowmore. Site 9 has 8 boulders is 13 meters in diameter; 9A has five huge boulders in a rough circle of 20 meters in diameter; and Site 10 has seven boulders in a rough circle 19 meters in diameter. There is no evidence of central chambers. These sites are on private land and are not accessible to the general public. No. 9. 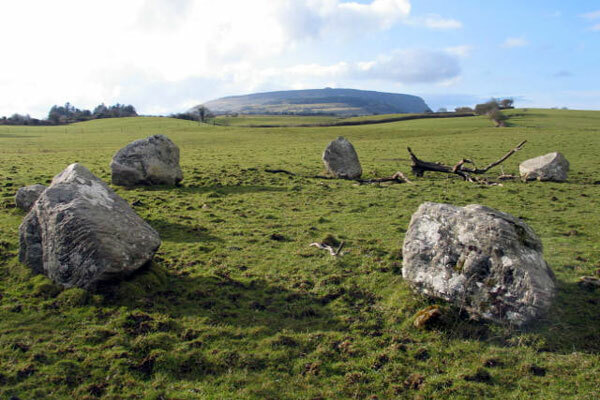 "Still further to the northeast, this circle consists of ten remarkably large stones, and it may be doubted if there were ever more than twelve originally. The diameter is 42 feet." - Petrie. "There are no traces of a cromleac," but in the plan given by Col. Wood-Martin, two stones, a large and a small one, are shown about 20 feet North of the circle. No. 9A. northwest of 9 (dolmen-circle ?). This is not mentioned by Petrie. "It is now represented by five stones; but, to judge by these, it must have been one of the largest of the series." - Wood-Martin. There seems no trace of a dolmen left. The diameter was about 75 feet (out to out). No. 10. Situated northeast of XII (dolmen-circle). "This circle is in part destroyed, but from the portion which remains it appears to have been one of the grandest of the whole series. As in the case of XII, it seems to have consisted of only twelve stones, of which eight remain, and are of unusually great size. The diameter of the circle was 75 feet. The cromleac, now quite ruined, was of corresponding magnitude, and an interment was found beneath it." - Petrie and Wood-Martin. Col. Wood-Martin's plan shows only seven stones of the ring remaining, and one small one lying southeast of the centre. 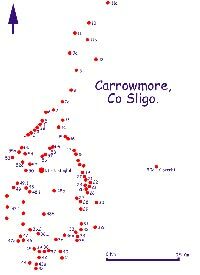 A circle to the north of Carrowmore illustrated by Wakemann, is probably Site 9. Image © Sligo County Sligo.